GE 47262, 100W, 120V, Cov-R-Guard, Rough Service Worklight, Shatter Resistant Glass, C-17 Heavy Duty Filament, 1230 Lumens, 1000 Hours, E26 Medium Screw Base, A21 Inside Frost, Saf-T-Gard, 47261 Substitute, MOL 5.25", LCL 3.81"
10W, E17 Intermediate Screw, 130V, Clear S11 Glass, SDK130V10W, Clara, 130 CPI, Sadokin, 130V10W, 10S11CLN130V, 41528, Lensometer, 16919, 12185, 37381-1, 373811, Satco 53844, S3621, 53621, S3844, C-7A, 1500 Hours, 80 :Lumens, MOL 2.375"
220V, 1500W, T3 Clear, R7s, 3000 Hours, RSC, R.S.C. $3.00 GE 72547, 130V150W, 130V, 150W, Rough Service, Saf-T-Gard, Inside Frost, 2120 Lumens, 1000 Hours, At 120V Typical Use 133W, 1650 Lumens and 2600 Hours, MOL 6.93"
$10.00 GE 19823, 150W, 120V, 5" R40 Reflector Flood Blue, E24 Medium Skirted Screw Base, Lt.Ins. 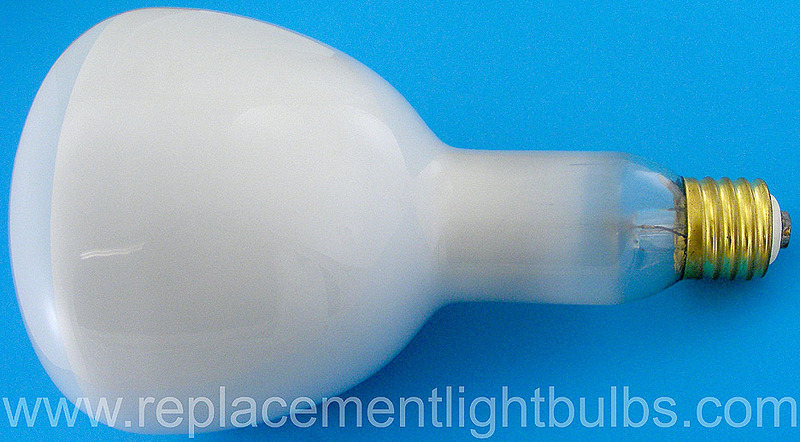 Frost, 19823-3, GE19823, 2000 Hours, CC-6 Filament, MOL 6-9/16"
GE 12784, 15W, 34V, A15 Inside Frost Glass, E26 Medium Screw Base, Train, 1000 Hours, 180 Lumens, Universal Burn Position, MOL 3.56", MMOD 1.875", LCL 2.37"
GE 20094, 1950 Lumens, P25 Clear Glass, 120V, 120V7, Traffic Signal, 901, Base Down to Horiz, Horizontal, E26 Medium Screw Base, 165W, C-9 Filament, 8000 Hours, MOL 4.75", MOD 3.125", LCL 3"
GE 25936, 200W, 130V, Extended Service, A-21 Inside Frost Glass, E26 Medium Screw Base, 3250 Lumens and 2500 Hours at 130V, 177W 2500 Lumens and 6800 Hours at 120V which is the typical use, CC-8 Filament, MOL 5.37", LCL 4.06" DIA 2.625, Burn Base Down to Horizontal but avoid horizontal burning with support spine beneath filament to prevent premature arcing. GE 46848, 30W, 130V, R-20 2.5" Indoor Spotlight, Light Inside Frost, 200 Lumens, 2000 Hours, E26 Medium Screw, C-9 Filament, MOL 3.93"
GE 48316, Sandblasted Pool Lamp, Pool Light, 120V, 500W R40 Silver Reflector Flood, E26 Medium Screw Base, 2000 Hours, CC-2V, 5500 Lumens, 3200 CBCP, MOL 6.75", Read Special Notice: Use only in swimming pool fixtures that comply with applicable safety standards and codes. Do not use if glass is cracked. 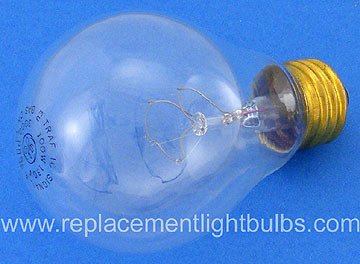 May not give satisfactory performance if any accessory equipment is attached to or touches the glass bulb. 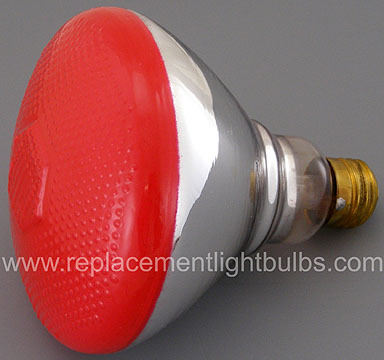 The bulb, although made of heat-resistant glass, may break if moisture falls on it. The lamp should be burned only in porcelain sockets, in a horizontal position. It should not be used in equipment where base temperature will exceed 500°F. Do not insert in household sockets. 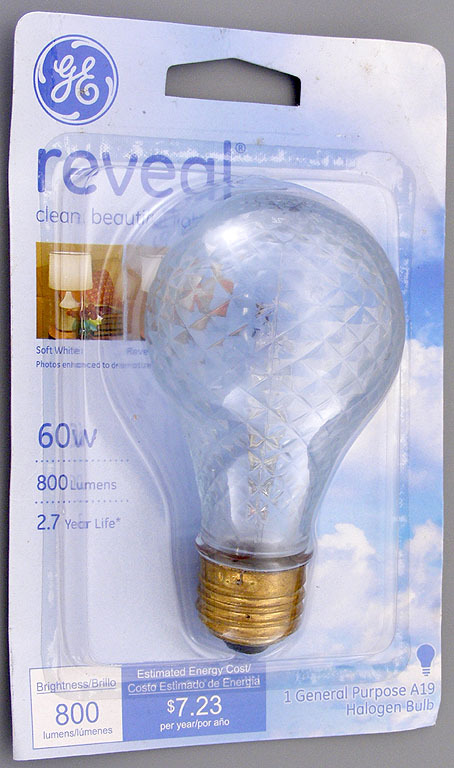 GE 21861, T-20 Clear Glass, 500W, Spotlight, P28s Medium Prefocus Base, 3000°K, 200 Hours, C-13, 11,000 Lumens, E-31501, Cat No. 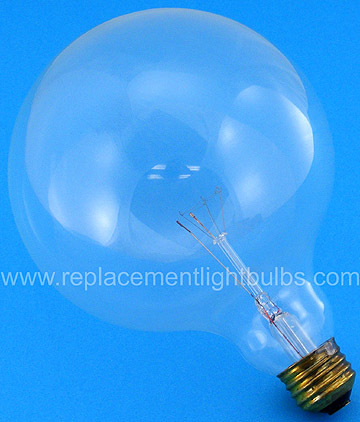 65, MOL 5.75", LCL 2.1875"
GE 44429, 50W, 120V, General Electric, Elliptical Reflector, 2000 Hours, 3806512, 0-43168-90692-0, FG3052-J, E26 Medium Screw Base, Inside Frost, 525 Lumens, 690 CBCP, MOL 6.25", MOD 3.75"
GE 20812, 50W, 120V, Rare Earth Neodymium Provides Balanced Spectrum Light, Reptile Rays, Daytime Basking Light, Spot Heat, Reveal, E26 Medium Screw Base, 2000 Hours, Terrarrium, C9 Filament, MOL 3.94", MOD 2.5", LCL 2.44"
60A21/R-120V $3.00 60A21/CR 60W 120V Ceramic Red, Replaces discontinued 40A21/R, 40A21/CR, 40A19/R, 40A19/CR for some applications where 60W is acceptable. GE 41837, 65W, 120V, Miser, Spot, Hot Pink, Indoor Spotlight 65, 2000 Hours, CC-6 Filament, MOL 5.37"